Trainer Laura Mongan is optimistic that last year’s runner-up Alsadaa can get his head in front in The Ladbroke at Ascot on Saturday, December 20, after the weights for the £150,000 Listed contest were revealed today. The five-year-old, who has been allotted 11st 4lb and is rated a 20/1 chance for Ladbroke glory by the race sponsor, found only Jack The Giant a length too strong in the race 12 months ago and returned to Ascot to finish fourth behind Sentry Duty over the same course and distance in a valuable handicap hurdle on November 1. Alsadaa, who has been successful at Ascot in both a novice hurdle in November, 2007, and a Flat handicap for amateur riders in September, comes into The Ladbroke on the back of a pleasing second on the all-weather in a Lingfield Flat handicap on December 5. Mongan revealed: “Alsadaa will definitely take his chance in The Ladbroke providing the ground is good. He absolutely relishes decent ground so we are just praying that there is not much rain between now and next weekend. “He’s a front runner and he needs good going to be at his best. I was delighted with his run behind Sentry Duty at Ascot at the start of November, especially because the ground was on the easy side of good. He loves it round the course and I think he would be there or thereabouts if he took his chance. “He will have no problem carrying 11st 4lb and I would be confident of his chances in the race following his good run last year. We were unlucky to come up against a horse like Jack The Giant and Alsadaa is in great form at the moment. The weights for The Ladbroke are headed Ashkazar, who is set to carry 11st 12lb and is currently the 6/1 joint favourite with the race sponsor. The David Pipe-trained winner of last season’s Listed Imperial Cup at Sandown is joined at the head of the market by the Gary Moore-trained Numide (10st 11lb) who recently got the better of Aigle D’Or (11st 11lb & 7/1) in a Grade Three handicap hurdle at Cheltenham. 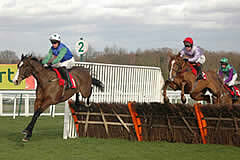 Pipe has also entered Acambo (11st 5lb & 25/1), successful in The Ladbroke in 2006, and Mamlook (11st & 25/1). Apart from Aigle D’Or, in-form trainer Nicky Henderson may also bid for back-to-back victories in The Ladbroke with Sentry Duty (11st 9lb & 8/1), French Opera (11st 3lb & 25/1) and Blue Shark (10st 12lb & 33/1), while Numide could be joined by stablemate Wingman (10st 11lb & 20/1), who took a Grade Three handicap hurdle at Newbury in February. The four entries from the stable of champion trainer Paul Nicholls includes Font (10st 9lb & 25/1), who beat Noble Alan (11st 5lb & 20/1) in a handicap hurdle at Cheltenham in October, and Take The Breeze (10st 9lb & 20/1). The Ditcheat handler has also entered Tchico Polios (10st 6lb & 25/1) and Five Dream (11st 10lb & 14/1), who finished a close third to Sunnyhillboy (10st 13lb & 10/1) and Spear Thistle (10st 5lb & 20/1) when carrying top-weight in a Listed handicap hurdle at Sandown on December 6. A strong Irish challenge of nine entries includes Grade Three runner-up Psycho (11st 3lb & 10/1) and the unexposed Mourne Rambler (10st 7lb & 25/1) from the shrewd yard of Tony Martin, recent Listed scorer River Liane (11st 9lb & 12/1), as well as 2006 Galway Hurdle winner Cuan Na Grai (11st 2lb & 20/1). Recent Fairyhouse runner-up Sky Hall (10st 13lb & 14/1) is one of three horses engaged by six-time Irish champion jump trainer Noel Meade. Other notable entries include Listed second Khyber Kim (11st 10lb & 14/1), course and distance winner Art Professor (10st 11lb & 20/1), and the Philip Hobbs-trained quartet of Hector’s Choice (10st 12lb & 40/1), Belcantista (10st 6lb & 20/1), Prince Taime (10st 6lb & 25/1) and Hibiki (10st 6lb & 25/1). The ground at Ascot is currently good to soft. Clerk of the Course Chris Stickels commented: “We are due some rain over the weekend and into Monday. The long-range forecast is for high-pressure to return in the middle of next week and I would expect next weekend’s weather to be similar to the present cold and sunny conditions. “I don’t anticipate the going to change significantly between now and then and expect ground similar to our first two meetings of the season." Class 1, Listed Race, £150,000 Total Prize Fund. 2.15pm, Ascot, Saturday, December 20, 2008. For 4yo+ rated 0-150. Two miles. Penalties: after December 6, a winner of a hurdle 6lb. No penalty to increase a horse’s weight above 11st 12lb. Entries closed December 2, entries revealed December 3 (56 entries), weights revealed December 10, five-day confirmation stage December 15, final 48-hour declaration stage 10.00am, December 18. Form figures supplied by Weatherbys and are correct up to and including the racing of Monday, December 1.